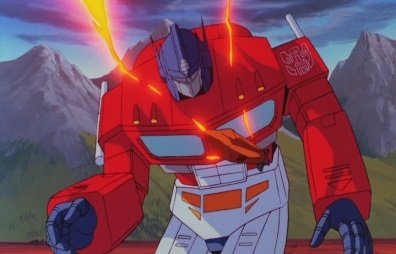 Optimus Prime transforms and heads towards the Decepticons, running Thrust and Shrapnel over before transforming and gunning down the others. 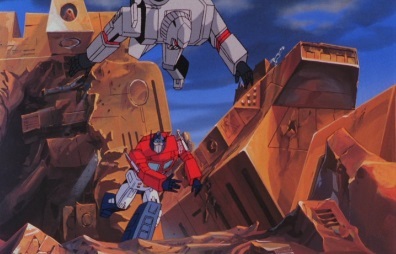 He heads through a broken wall and finds Megatron, and tells him that one shall stand -one shall fall. 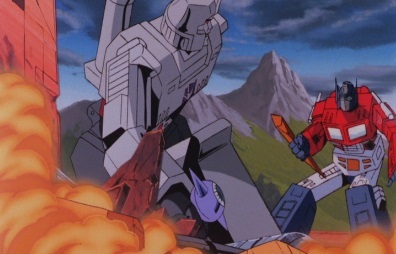 ...but Optimus avoids the shot and runs forward to punch Megatron in the face, with so much force he stumbles back into a wall and loses his cannon. 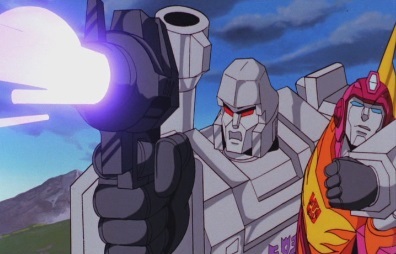 But Megatron happens to find a small laser sword next to him, and turns it on. 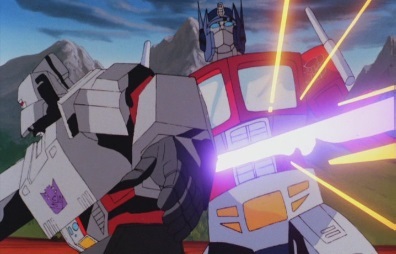 He runs forward and slices into Optimus, damaging his body. 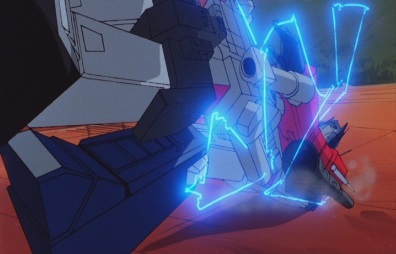 As Megatron leaps up, Optimus lands a punch on him that causes him to drop his laser sword, but he soon recovers. 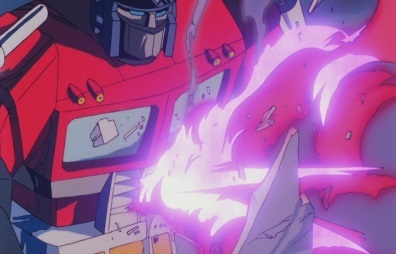 He wrestles with Optimus, determined to rip out his optics. 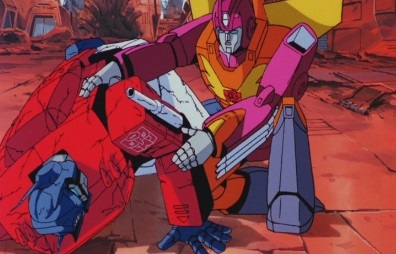 However, Optimus ends up throwing him. 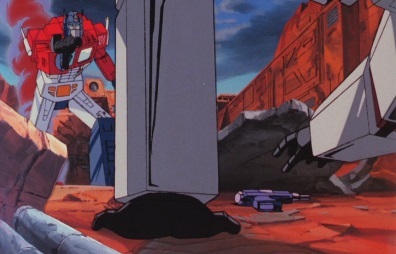 Megatron hits the floor and suddenly says he wants no more, begging Optimus to show him mercy. 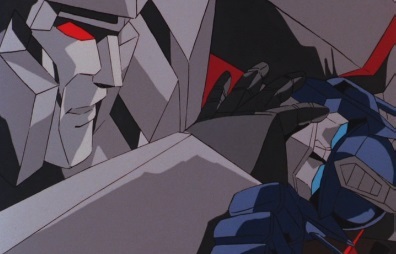 Optimus is surprised by his words, as he knows Megatron is without mercy -yet now he begs for it? He thought he was made of sterner stuff. 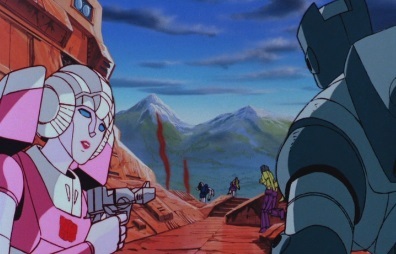 The reason Megatron is acting cowardly is because he can see something Optimus cannot: a blaster. 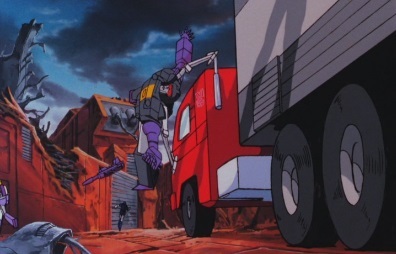 Just as he grabs it, Hot Rod appears and tackles Megatron, trying to stop him. 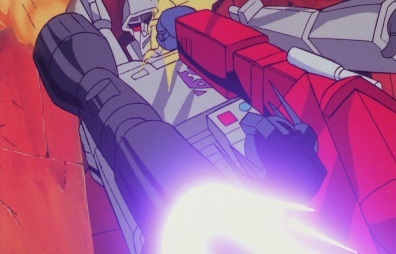 But Megatron gets him into a hold, and by using him as a shield, Optimus can't fire at them. But he can fire at Optimus. 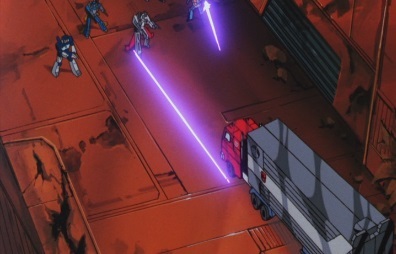 Megatron fires several shots, all of which hit Optimus, making him fall over. 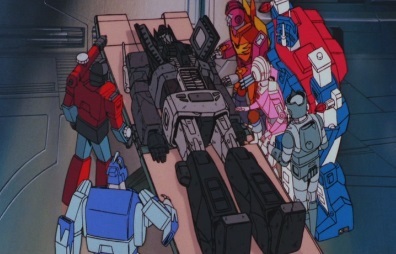 After tossing Hot Rod aside, Megatron moves in and says that he would have waited an eternity for this -it is finally over. 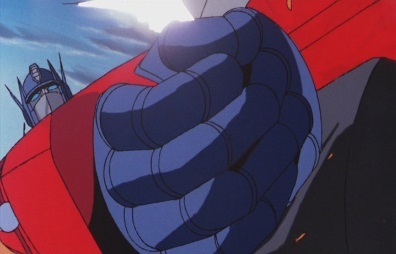 But before he can shoot, Optimus club punches him. 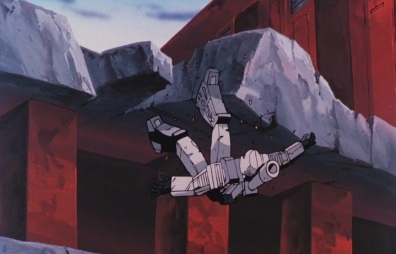 Megatron falls to the ground below, where Starscream sarcastically asks him how he feels. 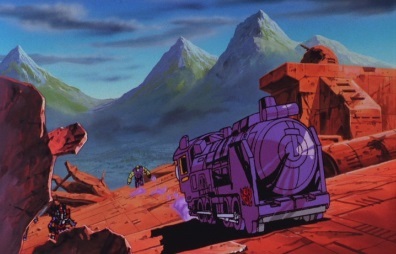 He tells Astrotrain to transform and get them out of here, but Megatron is still alive and asks Soundwave not to leave him here. 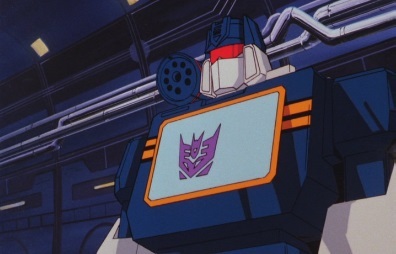 Soundwave picks up Megatron and gets him into Astrotrain, where all of the other Decepticons soon are. 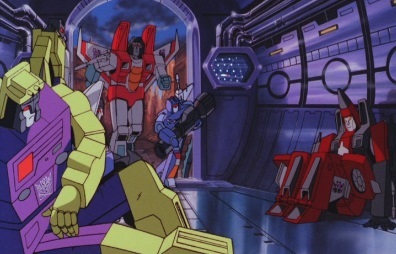 Starscream tells Astrotrain to take off, and soon the Decepticons are on their way back to Cybertron. 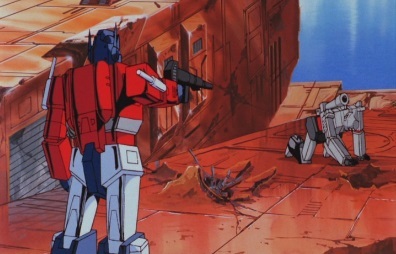 Later on, Perceptor checks over the battered Optimus Prime, but he fears that their leader's wounds are fatal. 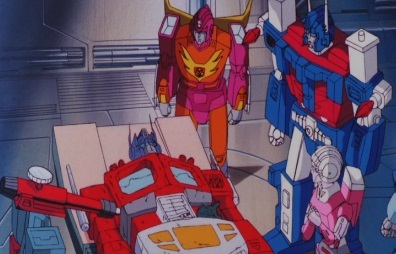 Optimus tells them not to grieve, as soon he shall be one with the Matrix. 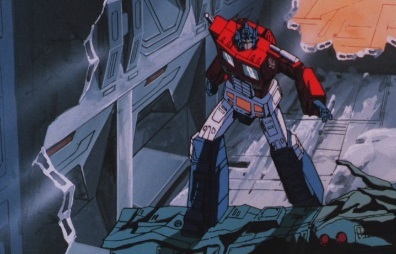 He tells Ultra Magnus, his old friend, that he shall pass the Matrix of Leadership onto him. 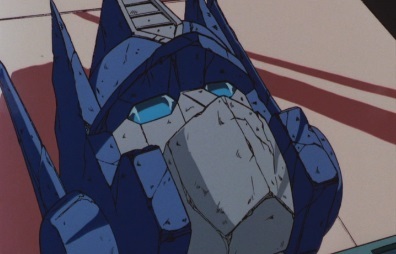 Ultra Magnus considers himself unworthy, as he's just a soldier. 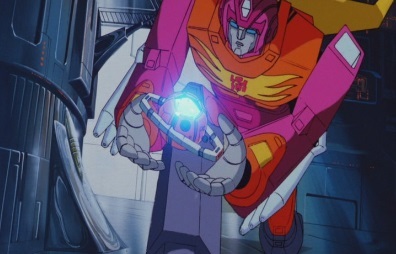 Optimus tells him he wasn't worthy when he received it either, but one day, an Autobot shall rise through their ranks and use the power of the Matrix to light their darkest hour. 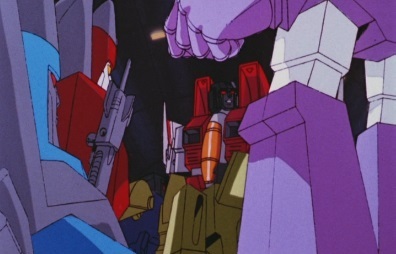 Optimus opens up a compartment in his chest, revealing the Matrix of Leadership. He says until that day, 'till all are one. 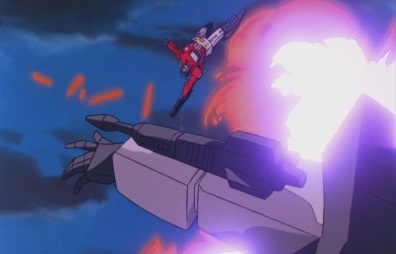 He drops the Matrix, but Hot Rod catches it and passes it to Ultra Magnus. 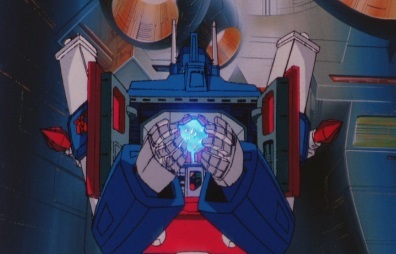 Ultra Magnus places the Matrix inside himself. 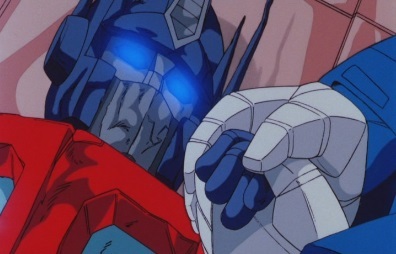 Optimus Prime's eyes stop glowing and his body loses color. He has died. 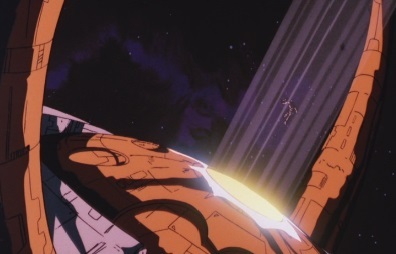 In space, Unicron has somehow seen the death of Optimus Prime. But he doesn't care about that, and is more concerned with the Matrix of Leadership. 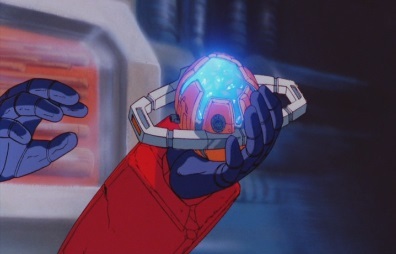 When he sees it being passed to Ultra Magnus, he screams in rage. 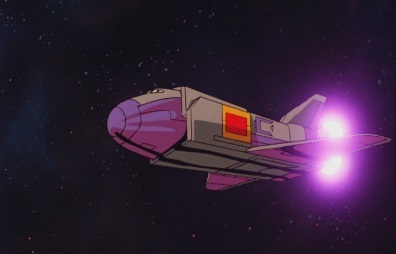 Elsewhere in space, Astrotrain complains that he'll never make it to Cybertron unless they jettison some weight. 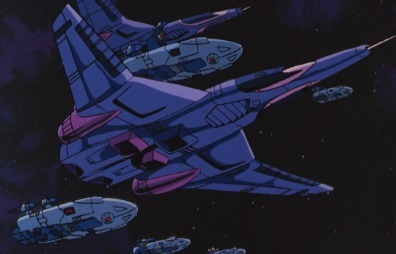 Starscream says they need to lighten their burden, and the other Decepticons think that it should be a survival of the fittest. 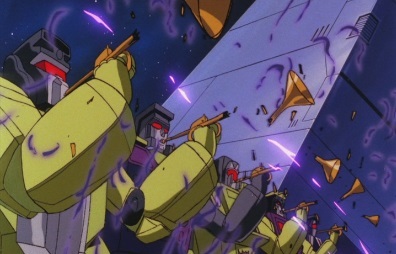 The injured Decepticons -Skywarp, Thundercracker and the Insecticons -are all pushed out, left to die. 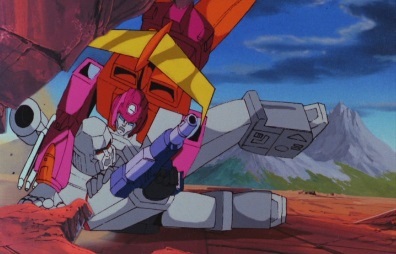 Starscream carries Megatron to the door and says how much it pains him to do this. 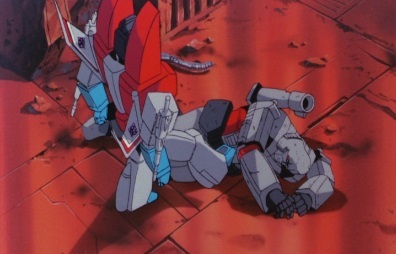 Megatron tells him to wait, as he still functions. 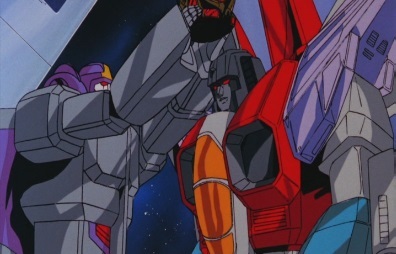 Starscream asks if he wants to bet, and then releases Megatron into space. 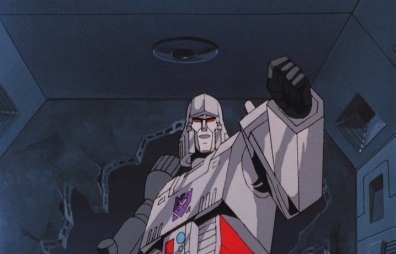 Since Megatron has departed, Starscream nominates himself as the new Decepticon leader. 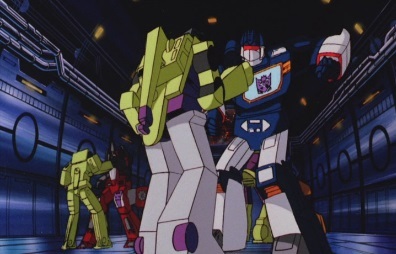 However, Scrapper says that he and the Constructicons form Devastator, the most powerful robot. They should rule. Soundwave disagrees, as Soundwave superior -Constructicons inferior. 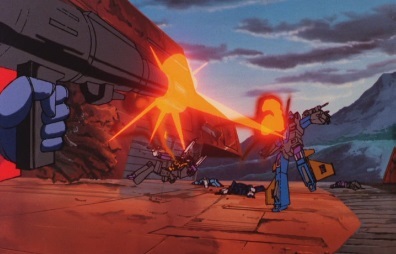 A battle breaks out between all of the Decepticons. 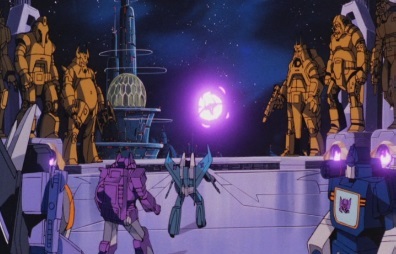 Meanwhile, the injured Decepticons happen to float by Unicron. 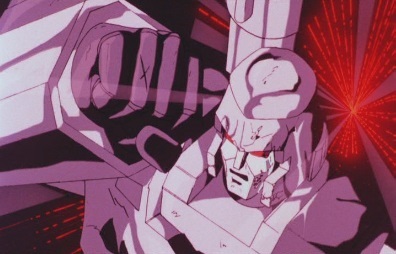 Megatron is barely alive, but he then hears someone speaking to him. 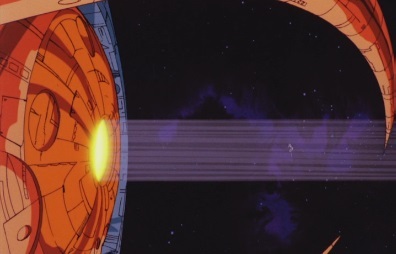 Unicron introduces himself, saying he has summoned him here for a purpose. He wants him to destroy the Autobot Matrix of Leadership. It is the one and only thing that can stand in his way. 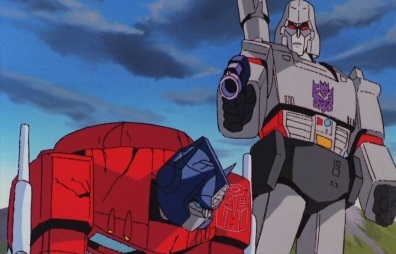 Megatron says he has nothing to fear, as he crushed Optimus Prime with his bare hands. 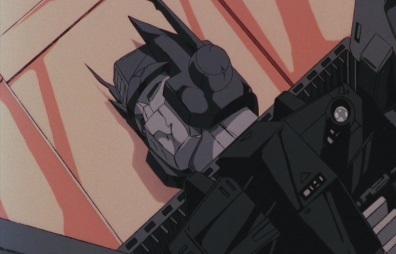 Unicron thinks he is exaggerating, but Megatron says the point is Optimus Prime is dead -and the Matrix died with him. 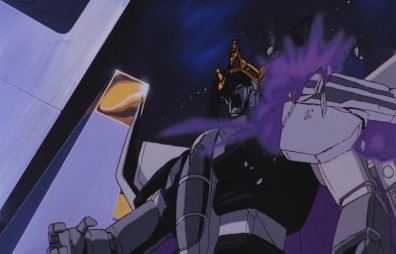 Unicron thinks the point is that Megatron is a fool. 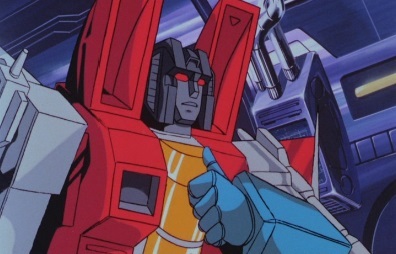 The Matrix has been passed on to the new leader of the Autobots, Ultra Magnus. He wants the Matrix destroyed. 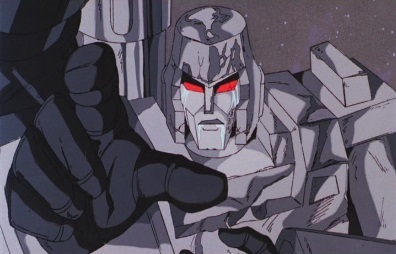 Megatron wants to know why he should do this, what's in it for him? 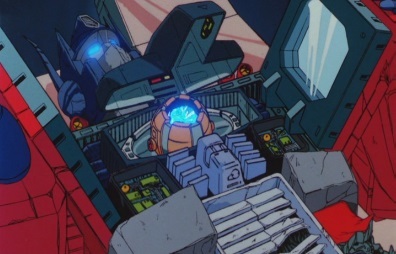 Unicron thinks Megatron's bargaining posture is highly dubious, but he can provide him with a new body, and give him new troops to command. 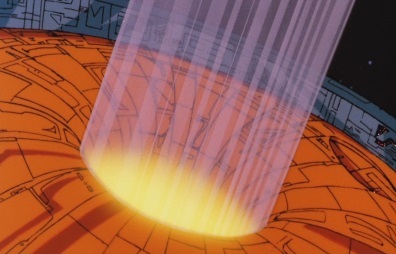 Megatron wants more, but Unicron says that is all he will get. He belongs to him, now. 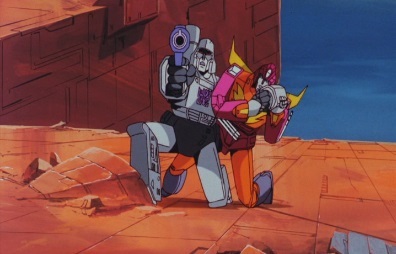 Megatron says he belongs to nobody, but Unicron thinks he misjudged Megatron. He tells him to proceed to oblivion, sending out powerful red waves. 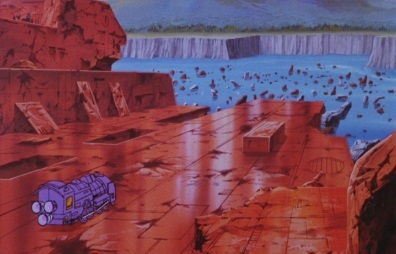 These waves threaten to destroy Megatron, so he changes his mind and says he accepts Unicron's terms. 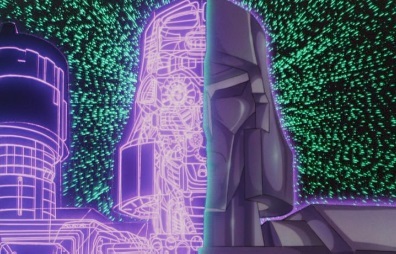 Unicron is pleased, and begins to reformat Megatron. 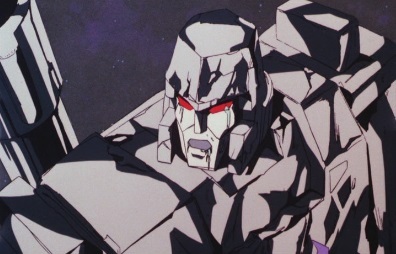 Megatron is gone, as he has been changed into Galvatron. 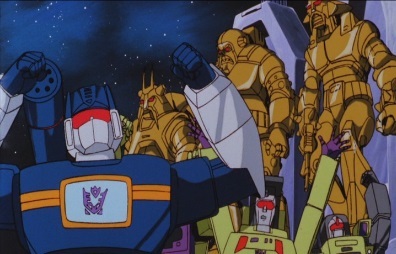 Unicron then says that the other Decepticons will become his new minions. 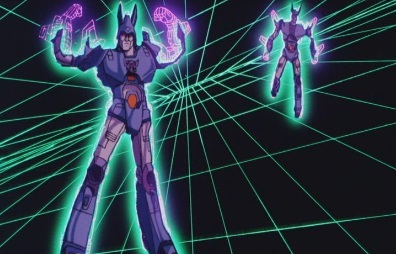 He reformats Thundercracker, Skywarp and the Insecticons into new robots. 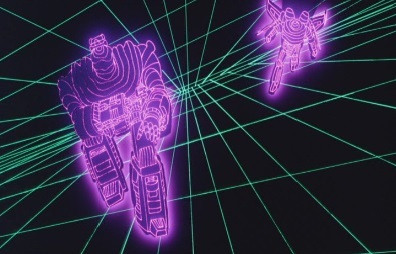 One of these robots is Scourge, and his huntsmen, the Sweeps. 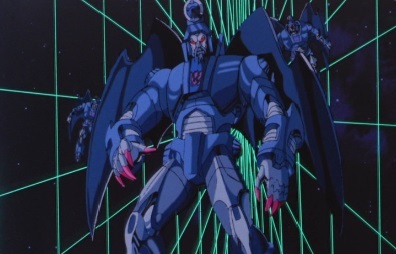 Another new Decepticon is Cyclonus, the warrior. 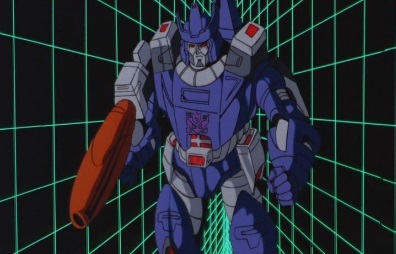 Galvatron says that he will rip open Ultra Magnus, and any other Autobot, until the Matrix has been destroyed. 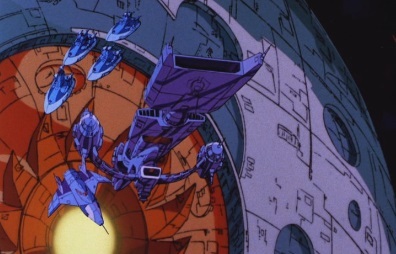 Unicron gives his new troops a ship, and Galvatron says that they shall go to Cybertron. 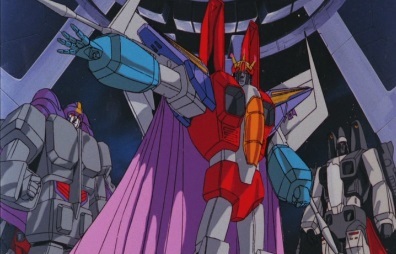 On Cybertron, Starscream has become the new leader of the Decepticons, and is holding a coronation ceremony. 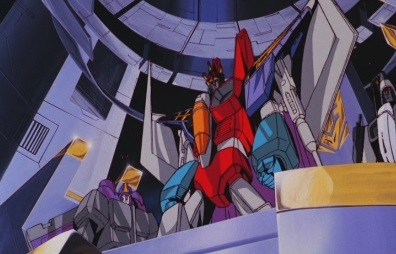 As he is crowned, he is about to give a speech when Galvatron and Cyclonus arrive. 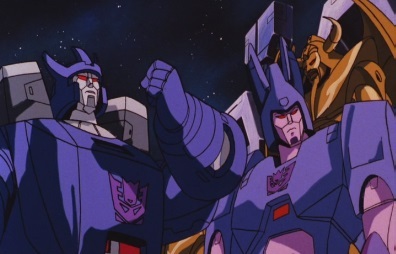 Galvatron thinks this coronation is bad comedy, whilst Starscream wonders if the one who interrupted his ceremony is Megatron. 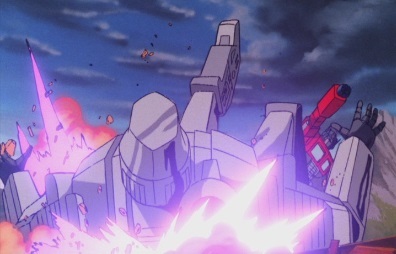 Galvatron says he has a hint for him, and transforms into a cannon. 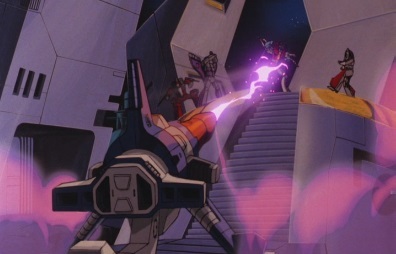 He fires on Starscream. 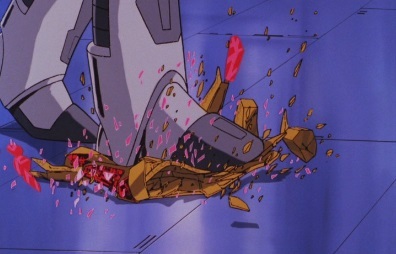 Starscream is reduced to dust in seconds. 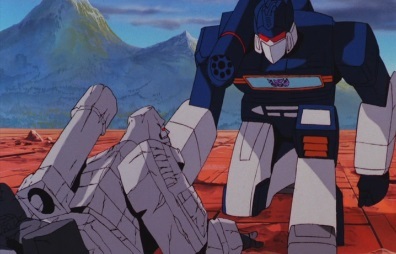 Galvatron asks if anyone else would like to fill Starscream's shoes, but Rumble asks for his name. 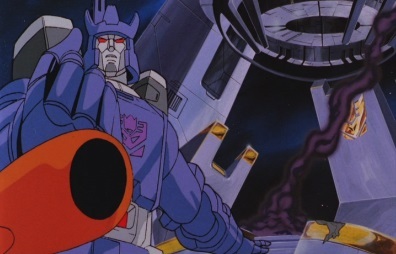 Galvatron introduces himself, and the Decepticon response is unanimous: all hail Galvatron! 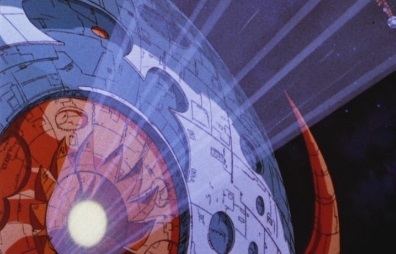 Meanwhile, Unicron starts his own plan, attacking Moonbase One. 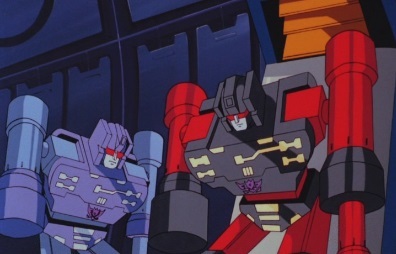 Jazz and Cliffjumper contact the Autobots on Earth, as Blaster picks up their signal. 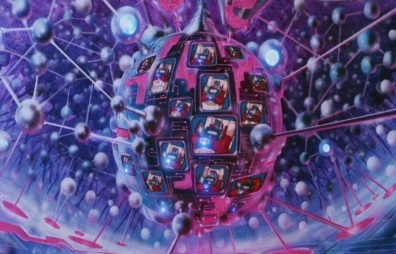 He transforms and lets the other Autobots hear what Jazz has to say, as he reveals that a ginormous looking planet has appeared, and is attacking Moonbase One. 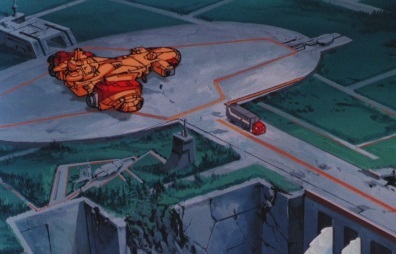 Jazz and Cliffjumper then have to leave, as they board a small ship and try to escape. 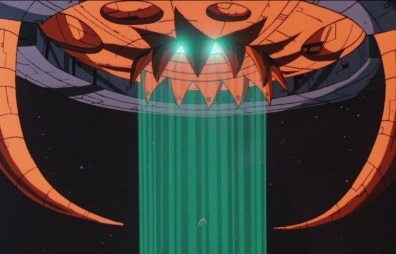 But their ship is sucked back into Unicron. Soon there is nothing left of Moonbase One other than some debris. Spike and Bumblebee then report to Earth, saying how a monster planet has appeared and ripped the first Moonbase to shreds. The monster planet is now heading their way, but whilst they will try to stop it, Spike says they need to get here fast. 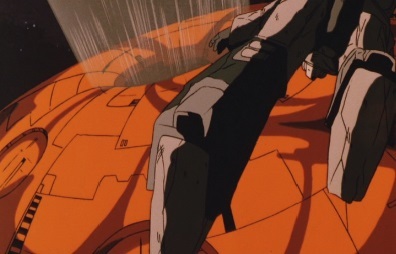 His communication is suddenly interrupted, as Unicron closes in on Moonbase Two. Bumblebee and Spike set Moonbase Two to self-destruct, and after starting a timer, they board a ship and blast off. 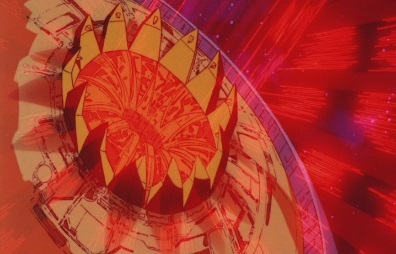 Unicron starts to consume Moonbase Two, but as he does so, it explodes. 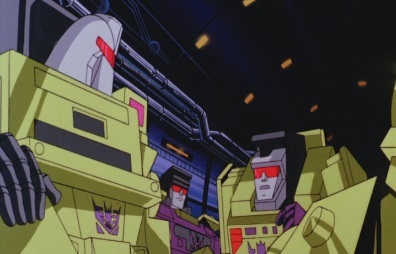 But as Spike and Bumblebee watch, they realise that the explosion hasn't even dented him. 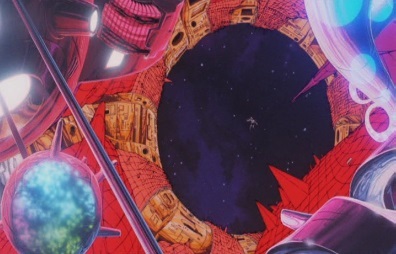 They are then sucked inside Unicron, as Galvatron watches in rage. 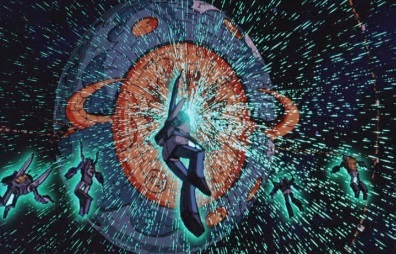 How dare Unicron do this -Cybertron and all of it's moons belong to him! 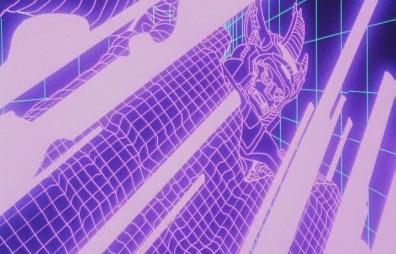 The red waves suddenly hit Galvatron, and he is put into great amounts of pain. 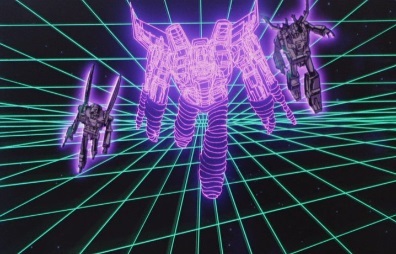 Scourge reminds Galvatron to remember that they all now belong to Unicron. 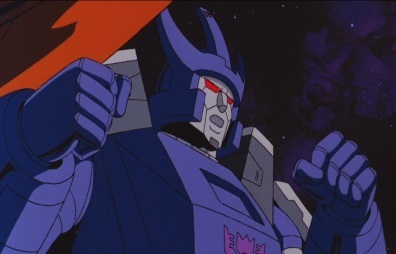 Galvatron eventually accepts, and says he will obey Unicron. 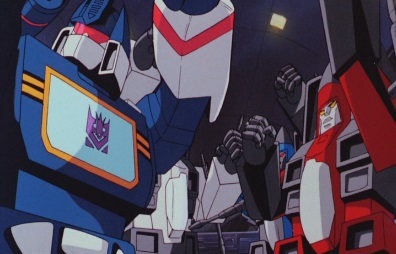 He then tells the Decepticons that they shall head to Earth. 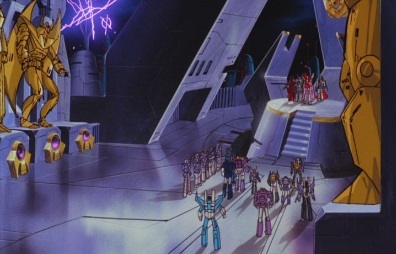 At Autobot City, Ultra Magnus tells the Autobots to prepare to board the shuttles. 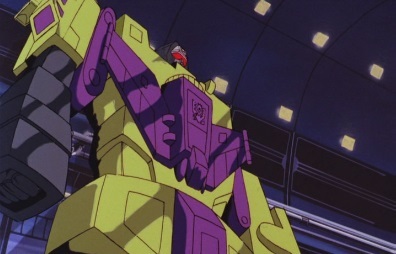 This new menace is a bigger threat than all of the Decepticons put together, and somehow, they must stop it. He thinks the Matrix may be able to help, and Hot Rod has a feeling he is right. 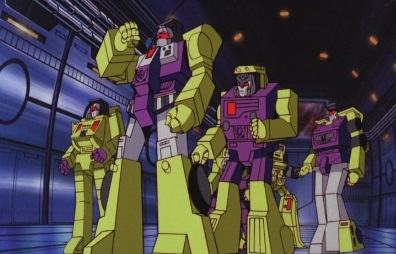 But then the Autobots find themselves under attack, as they see that the Decepticons have returned. 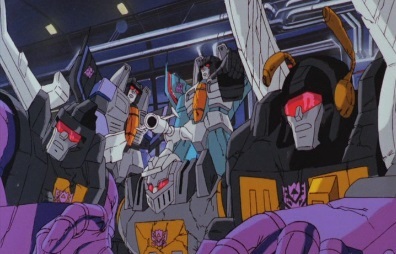 Galvatron introduces himself to the Autobots, saying he'll crush them just as Megatron crushed Prime. 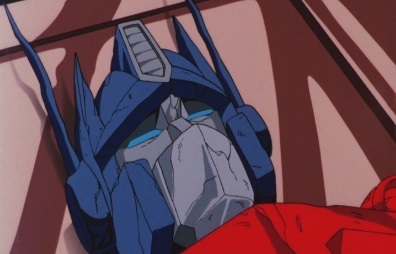 Ultra Magnus says he'll die trying, just like Megatron, and fires back. 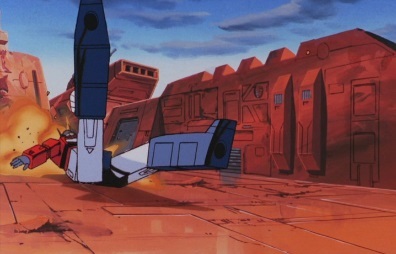 Blurr tries to get some of the Dinobots into a shuttle, but they want to fire, and start shooting down the Sweeps. 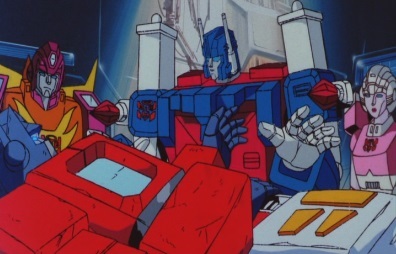 Ultra Magnus tells Hot Rod and Kup to get the Dinobots on the shuttle and take off. Hot Rod leads Grimlock into one, and the other Dinobots follow. Hot Rod's shuttle takes off, as Ultra Magnus, Springer, Arcee, Blurr, Perceptor and Daniel board the other one. 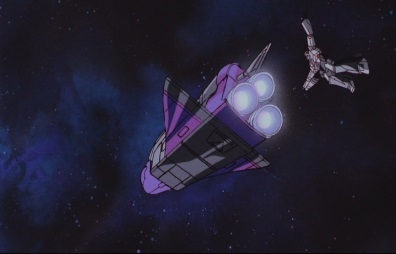 The second shuttle blasts off, leaving the Decepticons behind. 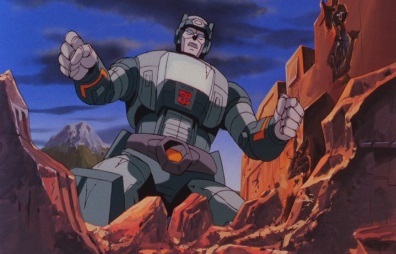 As the Autobots enter space, Kup keeps the Dinobots entertained by telling them one of his war stories. Hot Rod is fighting with a battle training robot, and he thinks Kup should have better things to do, like figuring out how they will save their friends. Grimlock would prefer the way story though. 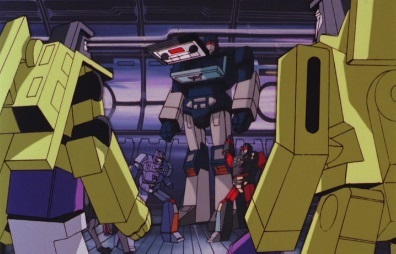 However, all talk is interrupted when the Autobots are shaken around inside the ship -the Decepticons are back after them! 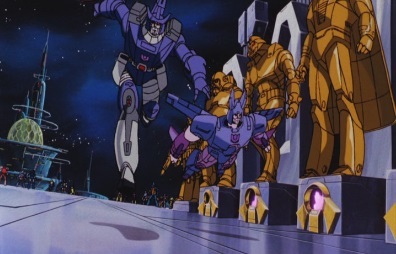 Galvatron sends Cyclonus out to attack, who goes after Hot Rod's shuttle. 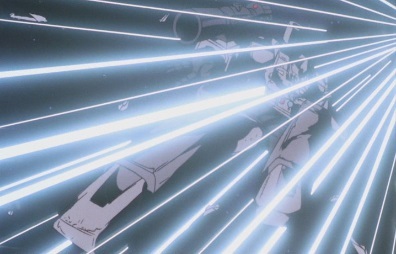 He starts firing lasers, damaging the shuttle so much that is goes off course and out of control. 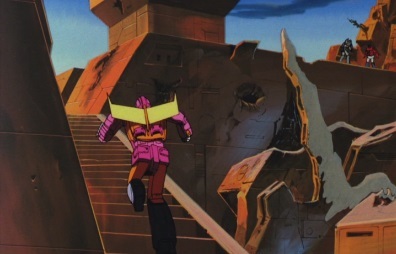 With one of the shuttles down, Galvatron goes after the remaining one. 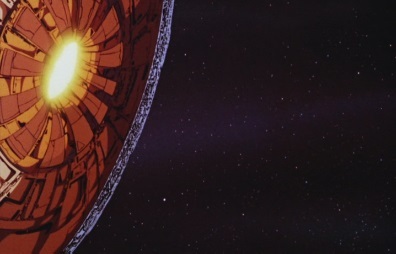 The damaged shuttle heads towards a planet, and Hot Rod realises that they are going to crash. 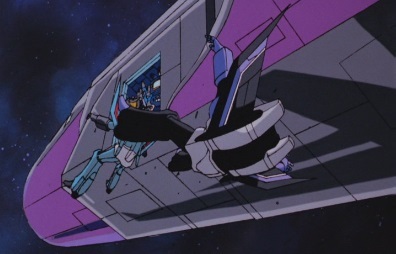 He and Kup have to leave their chairs, as the shuttle impacts on the surface and destroys the cockpit. The shuttle bounces across the ground, and crashes.